When a former Black Rose cartel assassin deliberately betrays them by refusing to complete her mission, the cartel orders her execution. Unknown to them, she fakes her own death and is able to create a new life of her own. When the cartel discovers she is alive, the hunter becomes the hunted as she fights to get revenge on those who took her new life away from her. This movie is directed by Pedring Lopez under Viva Films. CAST: Cristine Reyes, Germaine De Leon, Adrea del Rosario, Ronnie Lazaro, Johnny Revilla, Cindy Miranda, Freddie Webb, Guji Lorenzana, Jennifer Lee & KC Montero. Maria is truly one of the breakthrough Action Films after Buybust. I really admire the effort and the creativity poured in making this film. What I like about Maria is the fact that it was consistent with its R-16 content. Violent. Brutal. Gory. Anything you expect from its plot full of killings & betrayal is laid down very well. True to its premise, Maria is a complete bloodbath showcasing impressive and well-executed man-to-man fight scenes and some pretty amazing stunts & Cinematography. Well, I really adore the fight scenes between Cristine & Jennifer & Ivan & Cristine. These scenes are truly one of the film’s strengths. Aside from solid stunts & fight scenes, the plot of the movie is also relatable as it tackled drug syndicates and assassins in the Philippine setting. The Sequences were presented well and the Conflict of the whole story was justified from beginning to end. What I like about Maria is the fact that the whole film really invested on Production Design & Action Sequences. I didn’t see any cringe-worthy scenes at all. Well, the drama of loss was injected well to fire up Maria’s revenge plot. I must say, I admire Cristine Reyes for this role. She was born for this. She was a perfect fit. I couldn’t think of anyone who could portray MARIA other than her. Her action scenes were natural and were executed seamlessly. Ivan Padilla & KC Montero were effective villains. Oh! I must say that their English Conversations were just so lovely to watch on screen. At some point, I can imagine watching a Hollywood movie. Their actions scenes were also great. Freddie Webb was also good on his portrayal as the Master Villain even with the absence of action scenes from him. Overall, MARIA is something we could truly be proud of. How I wish many more audience could watch this movie. Wait, its R-16 by the way. It may be a little bit similar to other Hollywood Movies with the Revenge plot formula but I must say that MARIA was able to put a Pinoy taste as a whole. The whole movie is graphically-disturbing thus the R-16 Rating. 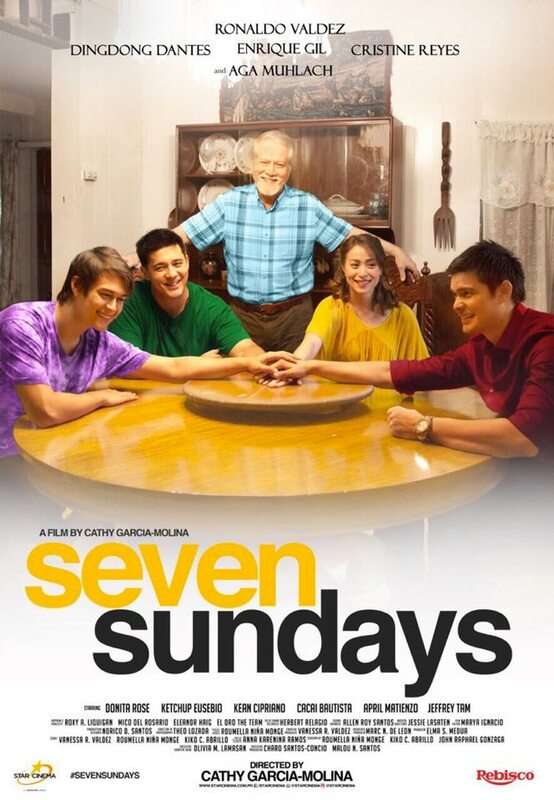 Seven Sundays is a story of the Bonifacio siblings, who reunite after their father is diagnosed with cancer. On the process, they have to deal with unresolved issues among themselves as they fulfill their promise to their father to stick together. This movie is directed by Cathy Garcia-Molina under Star Cinema. Seven Sundays is a cinematic masterpiece and one of Star Cinema’s finest films after Tanging Yaman. The film is a perfect blend of family drama, romance and heartwarming message that cuts deep. What I like about the movie is its faithfulness to the Filipino Family spirit and its direct and on-point interpretation of family-oriented values that most of us can relate to. Its very close to the Filipino audience as it tackles different issues within an ordinary family setting from indifferences and struggles that are realistic. I really commend the creativity on majority of the scenes specially the Opening Credits. Cinematography-wise, its impressive. Phasing and variety of sequences are great since the scenes were supported well with superb performances and consistent story-telling technique. The scenes and conversations were just right with the plot. I really love the script and choice of words too. Seven Sundays’ main strength is its impressive cast of characters. All of them were just great in their own roles and were all good compliments with each other. Aga Muhlach was a perfect choice as an eldest sibling. Dingdong Dantes’ portrayal of a rich sibling was good too. Cristine Reyes may play the same role of a estranged wife but this time, she is realistic. Enrique Gil’a role at first maybe vague and irrelevant but as the story progresses, he will bring us into a deeper take on his side in the family. Overall, Cathy Garcia-Molina did a great job in combining a stellar cast with a very heartwarming and inspiring plot material close to our heart. Worth-watching indeed. The ending is a bit off and cringe-worthy for me. Its forgivable though. For more features, like MC on Facebook. Fore exciting video features, subscribe at my Youtube Channel.